This is a tutorial on basic colouring techniques, namely how to build up shades and colours over an initial sketch in order to make an image looking all colourful and friendly. At some point I might make an "advanced" tutorial in this subject, but this will do for now. (You can also find it here on GT in [this] thread. This also kills two birds with one stone, since this tutorial can double as a walk-through of how to create this particular image (which some people have also requested)). I find it useful myself to see how others do these things, hopefully you can get some inspiration from it. If you do intend to follow this tutorial you may use it with any character design or image that you want. Would be fun to see what results you get. 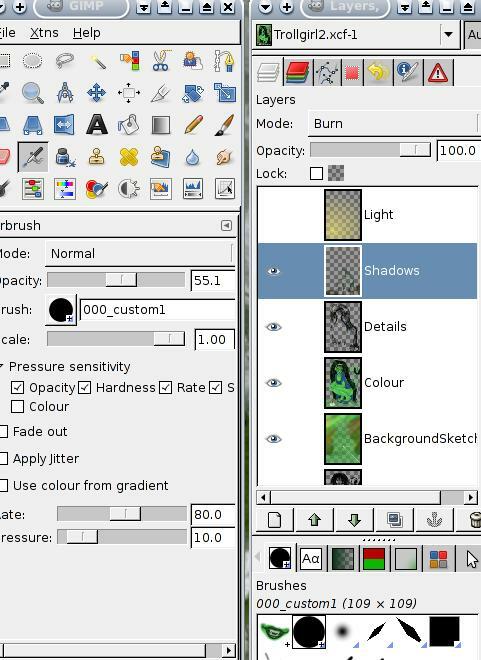 First of all, you need to set up your GIMP for dynamic brushes. This is of interest also for users of GIMP2.4, despite having brush scaling. You can see some reasons why in the recently updated Resizable brushes & basic airbrushing tutorial. Generally you want to check out that tutorial first anyway if you feel unsure about painting. It also covers setup of the tools as well as gives some simple exercises to get you going. Return here when you're done. In this tutorial you will be using the gradient tool, brush tool, airbrush tool, ink tool, smudge tool, eraser and the fill tool (in short, all the paint tools and then some). We will also play with some layer modes, so you should know how layers work if you don't already. No filters or such will be used -- this is all going to be old-fashioned manual labour. The original sketch. I will not be teaching out sketching in this tutorial, check out the Pencil drawing tutorial if you want more help. 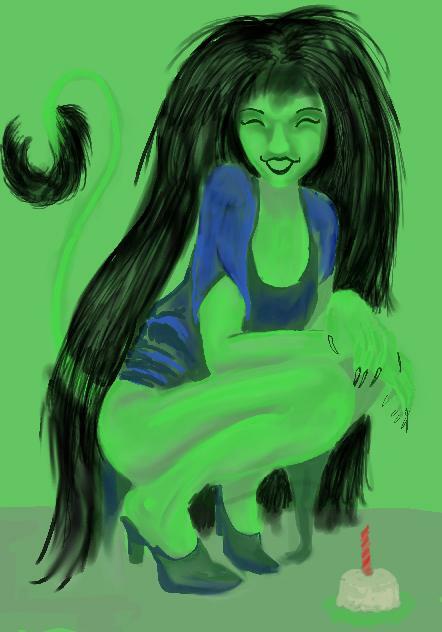 This sketch was done with the ink tool for her skin and the paintbrush for the hair. It was actually done in two steps, first a very ugly and scribbly-looking rough sketch and then a second clean sketch based on that, to get nicer lines (once again see the mentioned tutorial for details). I also used the eraser to clean out some stuff. 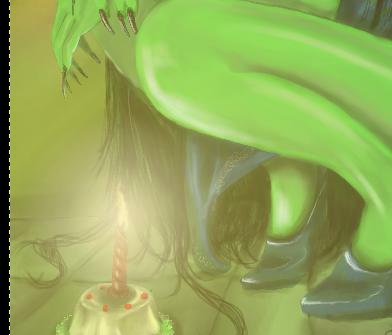 (Since this image was originally intended to be a mother's day card, there's a cake there too). Note that I have intentionally kept most surfaces clean from shadows and similar. The only really filled region is her hair -- this is because I know already that her hair will be black anyway. Also her hair is such a big part of this character that it was important to map its fall as much as possible already at the sketch stage. My GIMP setup. Note how I did the sketch on a transparent layer above the background. I never draw directly on the background since that doesn't have an alpha layer. This way I could move around the sketch and place it better over the white background, without bothering about any "checkermark" areas shining through. The pictures in this tutorial were taken from version 2.3 of GIMP, but this tutorial works just as well for both older and later versions. You will also see that I have my tool options permanently visible below the main toolbox. This is highly recommended, since you will be adjusting individual tools a lot. Another thing you'll note is my reference image to the right. This is my previous image of this character which I've been looking on to make sure she's still the same person, and to get similar colours. Don't be afraid to use reference! Tip: Flip your image horizontally a few times and make sure things look just as good at either orientation. It's easy to stare oneself blind, and flipping your image will lure the eye into giving it a "fresh" view. Repeat this flip now and then, to check yourself. 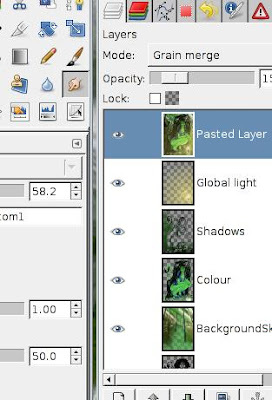 Create a new Normal-mode layer above the sketch layer named "colour background". Set it to 40% opacity. Here I have filled the screen with an even green. The green I picked is actually much brighter and satiated than it looks here -- since the background has a low opacity it looks darker, and its transparency allows us to still see the sketch. But it should be noted that the sketch will be completely covered by colour -- by the time we're done we should be able to delete the sketch completely without seeing any change in the image. For now, just leave the background being evenly green. You can easily change the background later, so just get it roughly right for now. Make a new normal-mode layer at 40% opacity simply named "Colour". This is the foreground, where you will colour all the things near us. I blocked in the ground with a 50% paintbrush (it is also near us, as far as we are concerned) as well as the rough colours of her dress with a 30% airbrush. Note the sloppy strokes. At this point we only want to establish what goes where in terms of colours. Since her skin will be green we can use background green colour directly. If you have trouble seeing the sketch through two layers of colour, you can move the sketch layer up and down to make it show better. Starting with the skin, use the colour picker to place you in the right colour region, then shift the colour value up and down a bit to create lighter areas and dark areas respectively. Start laying out the curvatures and local shadows of her skin. Make sure you never use any solid black or pure white at this stage! Note that we are not really showing global shadows yet (i.e. we are not really showing the shadows cast by the would-be candle on the cake) but only structures on her skin. Only way to that is to use various shades. Her ankle has been enhanced in the image above. Don't use any smoothing or other fancy tricks at this stage, you just want to map out the structure on her. Rather use the airbrush with low opacity to make semi-smooth transitions between different colours. Here we've laid out the basic colour structure, including some initial shadowing too. Note that I'm gradually covering all parts of the initial sketch, including the outlines. This means that the image can look a bit "vague" at this point. Check that you have copied over all parts of the sketch layer to the colour layer, then you can hide the sketch layer, you'll not use it any more. Notice how all colours are rather roughly blocked in at this point -- there is almost no blurring or smudging -- rather it's only the magic of the low-opacity airbrush that is working. I like to keep the colours rather bright at this stage. This is because I think it's easier to tone down a bright colour later but more difficult to bring life to a dull colour. Now we retake the detail we lost when we hid the sketch layer. We do this by adding contrast -- use the airbrush with a 20% opacity in burn or multiply mode to apply slightly darker colours around the edges. Note that you don't want to draw new black outlines, only make the contrast bigger. For example, note the dress over her bust being sharpened. All other remaining "lines" (like around her fingers) have at this point been reproduced with green lines instead of black. We will gradually blend them into the image to remove these lines as well. We can now bring the opacity of the background back up to 100%. As can be seen the actual colour I picked for the background now comes back and it's very bright. This doesn't really matter at this point, we have gotten the girl's colours down and can easily set whatever colour we want on the background since the background is on a separate layer. The bright colour also helps show off "transparent" areas in the girl that wouldn't show before. Since the dress is blue, I also started to fill it with a slightly brighter blue to "fill in the gaps", so to say. This is all done with the airbrush or paintbrush at 30-40% opacity, whichever you feel most comfortable with. The floor is a simple perspective grid (you can see the white perspective lines behind her; they were done on a separate layer directly above the background, so it could easily be hidden afterwards). I opted for hand-painting the stone slabs since it gives a more rustic appearance over using GIMP:s straight line features. Horizontally flip the image at this point, checking your work. It can be a good idea to work on the image flipped for a while, flipping back to the real orientation after a while to see if it looks as good. Now that we have established colours and rough structure it's time to start with the details. Here I found that I wanted her head to be tilted, so I simply cut it out and rotated it with the rotate tool. If you want help with colouring the face, you can take a look at the Portrait painting tutorial. Hair was done with the paintbrush at high opacity, using the airbrush for the highlights. This was just a normal hard round brush, no special hair brushes or similar where needed here. Work from dark to bright. In this case, there were very long strands of hair hanging about. Letting strands of hair fall over her face also can be a good idea. Tip: If you feel worried about drawing strands of hair down into your carefully drawn face make this part of the hair on its separate layer. That way you can experiment with strands without worry about messing up her face. Make a separate layer named "Details" for details like this, but don't be too paranoid. You should be confident enough in your own abilities that you should be able to correct the error if it should be. Her teeth are kinda special. It's difficult to show teeth since it's easy to make them look like they are either part of a snarl or a prostethic. 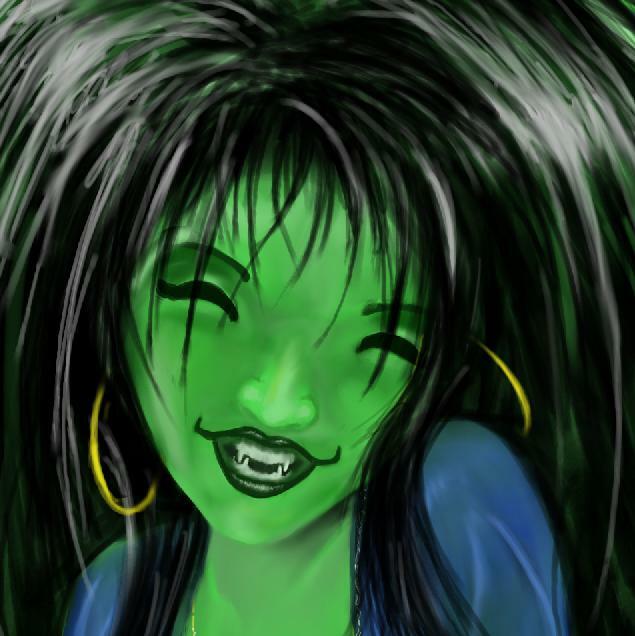 Unless you really draw a close-up portrait, try to avoid drawing any individual teeth (unless they are fangs, like here), but just use a white block to indicate them. That tends to look the best, in my experience. Some of the details are done, this is what we've got so far. I made a few broad diagonal brush strokes with the airbrush over the background to establish some sort of light source. Save your work if you haven't already. Now it's time to smoothen the colours together. Choose the smudge tool at 30% opacity and start carefully blend the rough colour patches together. This work requires patience, and you must be careful not to overdo it and destroy the colour contrasts you have so carefully built up. Apply your smudge tool in strokes, over and over to achieve the best result. Check out the Advanced airbrushing tutorial which also includes help with using the smudge tool to blend skin (and other materials). Take your time. The light in the background is coming from the upper left corner. But we should remember that the candle on the cake will be the main light in the image. It's time to add global shadows. Make a new layer named "shadow" (ignore the Light layer in the screenshot above for now) and set its mode to "burn". Pick a dark colour and a rather large round brush. On the shadow layer, use the airbrush at 50% opacity to lay out and enhance contrasts over the image. When you have laid them out, switch to the smudge tool at 30% opacity and carefully blend the shadows over the background as you did with the colour layer before. Take note of the details of her dress (the white lacing) and you'll find that they are not as detailed as you might have first thought. In fact, they are nothing more than some random scribbles in white using the ink tool. The reason they come out so sharp is because of contrast -- they are single-pixel wide whereas everything around them are smoothed out and flowing. Create a new layer "Global Light" and set its opacity to 40% or so. Paint in the candle flame. It need not be very detailed. Select the gradient tool and tell it to use the Fg->Transparent gradient (this is a standard gradient supplied with GIMP). Make it apply in a radial shape and pick a warm bright yellow as the foreground colour. Click in the candle and pull out the resulting gradient line as far as you can get, in the upper opposite corner of the image. This will create a "glare" effect that simulates the viewer being slightly blinded by the light. If you think it's too much, lower the opacity of the global light layer or play with its mode until you have something you like better. We are nearly done. We just need a more interesting background. 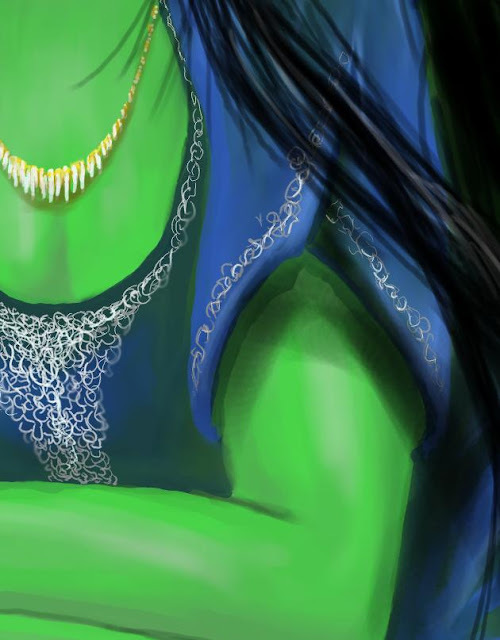 Hide your troll girl and switch to the so far neglected background layer. The background can be pretty simple, as long as you make sure the light comes across. Here I have made some rough diaginal "light lines" from the upper left corner and penciled in some tree trunks with the paintbrush. That's really all there is to it. Everyone's gonna look at the girl anyway. 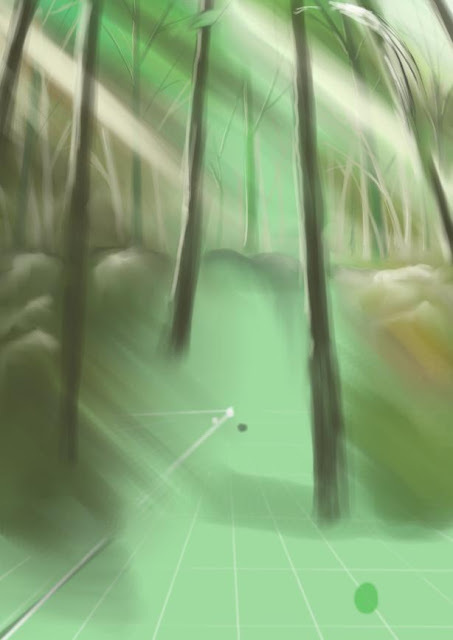 If you want help to do the tree background, there is a tutorial for it called The Forest Background tutorial. It's easy to do and worth a look. Finally, we want to make the image more "fantasy"-looking (as if the green troll is not fantasy enough!). We do this by adding an effect slightly similar to "bloom" in some computer games. What you essentially want to do is make a duplicate of your image, blur it a bit and then add it on top of your image as a layer with some creative mode. You can do this either on only the girl, or on the entire image. Do "Layer from Visible". This layer you blur (gaussian blur with a radius of 30-50 or so), then make it transparent and with a mode like Grain merge or Screen. Experiment here for a good effect. Take a look at the Adding Fantasy mood tutorial for details on this procedure and some more hints. Some last tweaks (changed her knee a bit), and we are done! Hope you found this tutorial interesting and that you got some new ideas and inspiration.